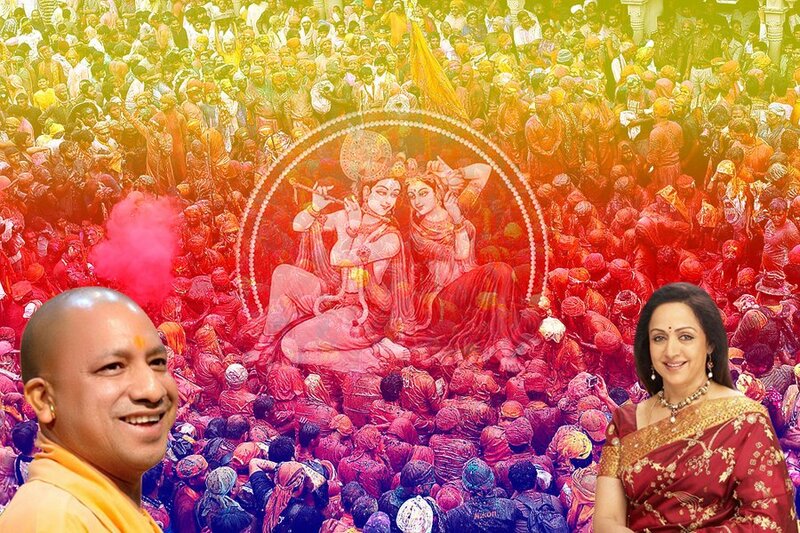 Celebrate Holi in Mathura - Vrindavan - Barsana - Gokul- Nandgayon...the Land of Lord Krishna ! It is certainly the ideal place to be in during this season! With colors and naughtiness in the air, lingering smell of sweets and happy colorful faces greeting each other, everyone wishes to be a part of this amazing extravaganza! 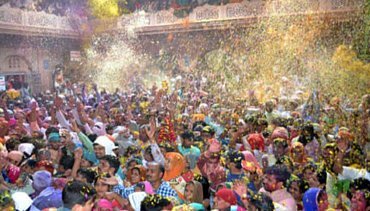 It is a month long fiesta beginning in February and ending with the grand Mathura Holi celebrations in March. It covers the whole Brij Bhoomi, from Gokul, Vrindavan, Barsana, Nandgaon to Mathura. Month long events at these places leave you mesmerized! And why not! Every Year International TV teams, Celebrated Dignitaries, Photographers & Tourists from all continents throng to Mathura to see this spectacle! 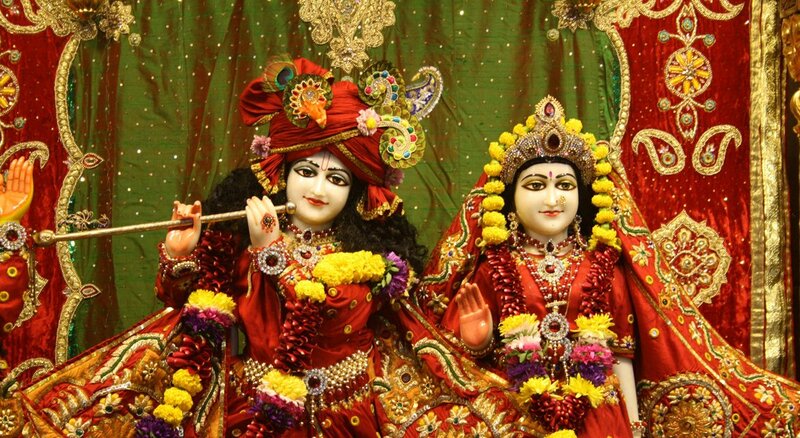 Mathura and Barsana Holi is world famous where Lord Krishna plays with his Friends and Gopis. Braj Holi attracts laks of domestic and foreign tourists who come to enjoy the fun filled beatings. So, come celebrate Mathura Holi 2019 and cherish the experience for a lifetime! Holi & Places to Cover : Barsana Lathmar Holi and Mathura Vrindavan Tour. 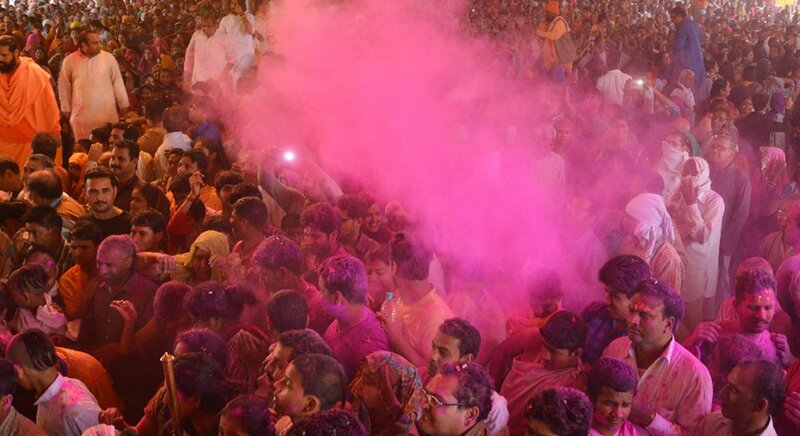 Holi & Places to Cover : Barsana Lathmar Holi, Nandgaon, Mathura and Vrindavan Holi. Dates : 14 March to 22 March. 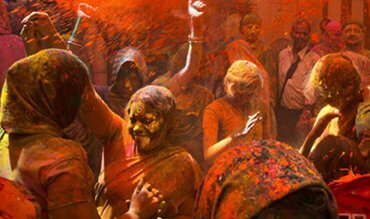 Holi is a joyous festival and understandably, the Braj Bhoomi celebrates it in a special way! Here, every town has its own unique events to enjoy the festival! At Barsana, they have the Laddu Holi which is celebrated in Shriji Temple, a beautiful temple dedicated to Radhaji, in a big way. Unique they aren - the Brajwasi (natives of Braj area) and they leave no stone unturned to enjoy their beloved festival and render it a unique glory! The Lathmaar Holi is not only a game of fun but it promotes women empowerment! Shri Krishna had great respect for women and always supported them in times of misery. So during Holi women get to demonstrate their power freely with a dash of fun. If Barsana can, how can Nandgaon be left behind? The next day is the turn of the Nandgaon ladies to take sweet revenge. It happens that the Barsana boys come to Nandgaon to immerse the women in a splash of colors but the Nandgaon women use their bamboo sticks shun off the men And the duel takes the form of a grand celebration which is famous worldwide. There are showers of colors, sweets and other delicious items and a large gathering immersed in this lovable game where women attack men and men while saving themselves try to color them. So do not wait, just get ready to come to Nandgaon and participate in the Lathmar Holi of Nandgaon Really, you are going to love the atmosphere. 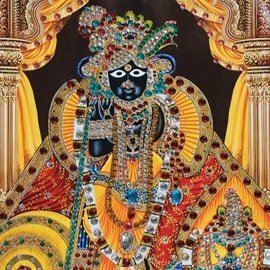 Rangbharni Ekadashi signals the advent of the great day And naturally it is celebrated with much fervor and excitement in one of the oldest and world famous temples of Vrindavan the Banke Bihari Temple. The natives and Shri Krishna followers assemble there and play with colors. It is a beautiful demonstration of the feeling of love, brotherhood and happiness! The brightness, colors and joy is a sight to see! The time has come for Holika Dahan! A pyre is prepared on the eve of the Holi festival symbolizing the burning of evil (Holika). The legend goes that her brother 'Hiranya Kashyap' was immensely angry with his son Prahlad and asked the evil minded Holika to take him in her lap and sit in the fire as she had a boon to stay unaffected by fire! But 'Prahlad', a Vishnu devotee was saved and 'Holika' got burnt instead this win of goodness over evil is celebrated by burning this pyre and taking a round of it. 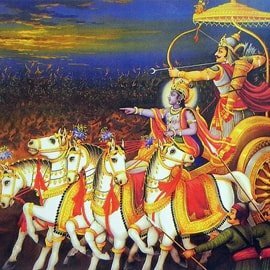 It is celebrated with much fanfare in Mathura and the whole 'Braj Bhoomi'. It is also time for family reunions and people worship together and share the joy of love and brotherhood.